Rank: #5 out of 42. 2019 DESIGN WITH AMAZING QUALITY AND PERFORMANCE FROM A COMPACT PENCIL SHARPENER: Built with the needs of artist, teachers, students and business people in mind, this electric pencil sharpener boasts the best in performance and durability. Crafted from high-quality materials, it does the job right every time. ADULT & KID FRIENDLY: Our innovative, auto-stop safety feature prevents this pencil sharpener from being used if any part of the assembly is missing. That means no hurt fingers, which makes it an ideal choice for classrooms with young kids . IDEAL FOR ANY SETTING: This versatile pencil sharpener handles colored and soft lead pencils with ease. Looking for a colored pencil sharpener? This is it! Looking for a solid standby to sharpen No. 2 pencils? It does that too! MANUFACTURER GUARANTEE: TripWorthy stands by all of our products and each are backed by a Manufacturer Warranty. If you're not satisfied, we're here to make things right. 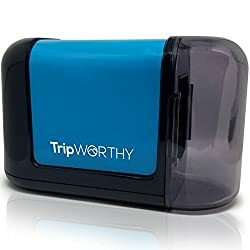 TripWorthy Battery Operated is a very popular option in the middle of the electric pencil sharpeners price range. It's in the top 3 bestselling electric pencil sharpeners and has many popular alternatives in the same price range, such as Bostitch QuietSharp Executive or Artist Choice Heavy Duty . TripWorthy Battery Operated is $5.10 less expensive than an average electric pencil sharpener ($22.98).